It’s really not about the cloud – not at this massive $34bn price tag. IBM's ingestion of RedHat, the third largest IT purchase in history, is all about Open Source. Commentators are already pitching this deal as long-awaited reinforcements to the trench-warfare of the cloud wars. But in reality, we need to look much deeper to understand what persuaded IBM to part with such an exorbitant sum of money for Open Source giant RedHat. Did we read that right? $34bn? – And what will happen to renegade RedHat? Even for budding venture capitalists, the princely sum of $34bn is more than enough to make your eyes water – especially when it’s hurled at a firm with annual revenues of just $2.9bn and headcount that will be just a drop in the Big Blue Ocean. So there must be more to IBM’s thinking than a quick financial return – it’s either a play to kick the other hyperscale players out of play, or a push to get the upper hand in the increasingly valuable Open Source sharing economy. RPA is a gateway drug - and magically these guys agree too! Don't you just love coincidences..
Disruption is more ripe in the call center space than any other corner of the services industry, and $1.6bn provider SYKES just upped the ante to feverish levels by becoming only the second-ever service provider to acquire deep RPA and intelligent automation expertise, since Accenture picked up Genfour 18 months ago. And $70m cash is a not insignificant sum to invest in consultative talent in this fast-emerging space in desperate need of experience and scale. So why is SYKES acquiring Symphony meaningful? None of the "traditional" call center providers have upped the ante with automation. Until now. We have found this bizarre, as there are so many opportunities to improve broken processes, speed up customer response capabilities with both Robotic Process Automation (RPA) and Robotic Desktop Automation (RDA). There's no surprise many of the Indian-heritage providers are jumping back into call center, sensing an easy opportunity to take business from vulnerable traditional call center providers with a disruptive automation-centric approach. SYKES is not beset by legacy enterprise deals choking the life out of it. Call center providers that got too beholden to legacy clients with dinosaur FTE pricing models are really struggling. This was one of the prime reasons Convergys (despite being one of the industry's finest purveyors of customer care) struggled to maintain market growth and ended up being acquired for an extremely attractive price by Concentrix earlier this year. SYKES is currently the 7th largest player in the contact center space (3% market share) with revenues of $1.7bn - enough to compete at the high-end, but still nimble enough to build a base of automation-led clients, chase strategic deals and be a disruptive nuisance in a market with razor-thin profit margins. 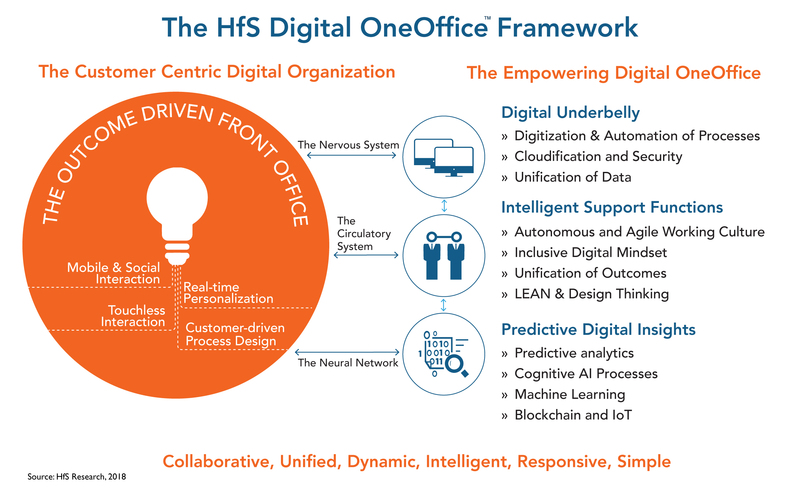 The Digital OneOffice is where teams function autonomously across front, middle and back office functions to promote broader processes with real-time data flows that support rapid decision making. It’s where front, middle and back offices will cease to exist, as they will be, simply, OneOffice. SYKES has a unique opportunity to consult to enterprises to make these front to back connections and weaves these capabilities into their managed services offerings. The merged entity can offer real expertise to provide automated processes as-a-service and help their clients through the journey. The only missing pieces, in the short-medium term, may be to diversify further into the middle office areas and analytics to add some real end-to-end process value, but much of this can also be accomplished through some smart partnerships. SYKES has already been making serious investments in digital capability. The Clearlink acquisition gave SYKES capabilities in the digital marketing space, which is complementary to its core business and also a differentiator from its peers in the contact center world. SYKES’ strategy here is to connect across the customer lifecycle for an “omnichannel” solution— really digital CX. Qelp is another acquisition that expanded SYKES’ value proposition outside of core contact center services — a call center software firm specializing in self service on mobile phones, a real boon for its telecom clients. SYKES has a sizeable WAHA delivery workforce (acquired through Alpine Access in 2012) which is a particular strength for its retail clients. The scalability and virtual training of this program is particularly effective. OneSYKES, its cloud delivery and WFM platform enable this capability. The platform also enables customer interaction analytics. SYKES' strength in the retail and telecom businesses. 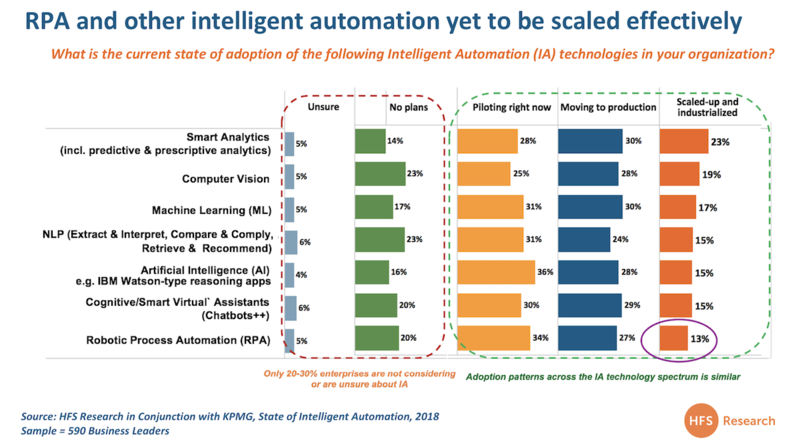 These are two of the most prime industries for automation-centric offerings, and where demand is very high (see earlier post on vertical focus in RPA). Added focus in the financial services sector would also be beneficial post-merger. What does a SYKES/Symphony really bring to the table? One of the last remaining automation services independents with credible global scale. With Genfour long out of the picture (and submerged somewhere inside Accenture) there are very few independent automation consultancies left worth evaluating that can impact a business the size of SYKES. Sure, there are some boutiques, such as Virtual Operations, Mindfields and Roboyo, that add some domain expertise, but nothing close to the scale of Symphony, which has 200 FTEs across Europe, North America, India and Mexico. It will be hard for any of SYKES' competitors to respond in kind, and we are quite amazed that only one of them had made a serious move to acquire Symphony prior to SYKES' interest. Skill+Scale. Enterprise clients want the skill of the small guys (but not the risk), the scale of the big guys (but not the baggage). 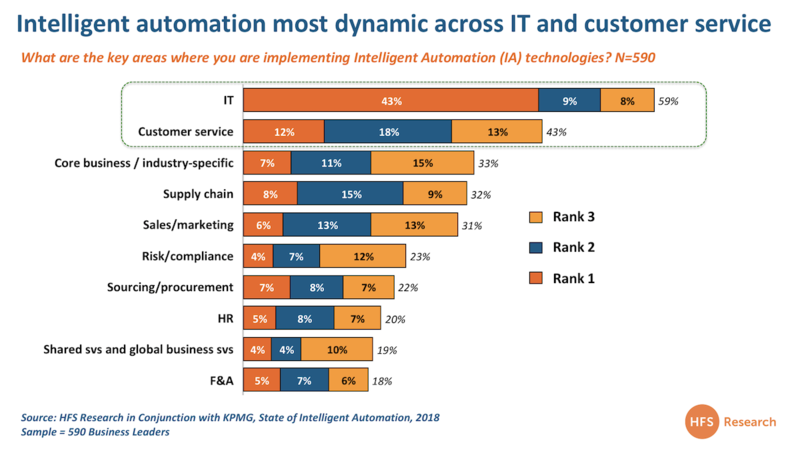 This sends out a shot across the bow to the likes of Accenture, Capgemini, Cognizant, Deloitte, EY, Genpact, KPMG etc., all competing in the quasi-consultative / managed service market... that is automation-led capability. Appeals to the RPA software firms. The likes of Automation Anywhere, Blue Prism and UiPath will welcome any deal like that that takes them more into the front office of enterprises. This will also attract the attention of Nice, which has a strong call center automation focus. Other aspirational RPA firms, such as Pega, WorkFusion and Kofax, will also take notice and want to engage with this new entity. Streetwise expertise. The four founders all bring a "hands-on" credibility to the table, which most organizations like to deal with: David Poole, Ian Barkin, David Brain and Pascal Baker. Many enterprises are already frustrated dealing with some of the usual suspects and may be tempted to switch to this new entity to take its OneOffice play to a new level. Obviously, much depends on SYKES leadership's ability to retain the Symphony talent and engage them with a compelling global story. Hands the Symphony team significant enterprise access. This will catalyze growth and disruption by giving Symphony access to a unique portfolio of 200+ enterprise clients including more than 50% of the world’s top 100 brands. While the Big 4 RPA experts struggle to convince their global partner colleagues to let them near their deep-pocketed clients, SYKES should have no problem opening the kimono to its finest differentiator that none of its competitors can (currently) boast. This struggle to get to a point beyond pilot exercises and project-based experimentation could prove to be a serious point of failure for the whole industry drivthese solutions. There needs to be a much stronger melding of enterprises with implementation and consulting capability to fix these issues. This has to be an area where a SYKES/Symphony can profit. If I had to count the number of truly successful services / consulting mergers over the past decade, it wouldn't take me very long, or require too many fingers. In so many cases, the acquiring firm is checking a box before moving onto the next shiny new object. What excites me about this move is the size of SYKES to make this really significant for the firm, the fact Symphony gives it a capability truly differentiating and hard for its competitors to replicate, and the fact it becomes the first customer-centric service provider to tackle the unquenched thirst for automation across customer processes to drive genuine OneOffice endstates. But this is a market that simply refuses to stand still... this has to be a merger that both parties fully embrace with the verve and energy that took Symphony from a great idea in 2013 to one of the most disruptive and exciting consulting businesses in the business operations industry. That means SYKES needs to do a much better job of articulating to the world what it brings to the table, especially in the cut-throat world of customer experience BPO. SYKES leadership needs to make Symphony front and center and refuse to blunt its edge in driving narrative - staying ahead of the curve and forging great industry relationships. Anyone failing to escape the swirl of intense hype threatening to destroy everything great about RPA is probably thinking that these cute products are going to solve all their artificial intelligence needs and deliver them with a "digital workforce" that will go way beyond scraping screens, producing scripts and running unattended recorded process loops. Now, don't get me wrong - I LOVE RPA... jeez, I bloody helped create the space when I first wrote about it in 2012. I don't want to toot my own horn, but this space probably never have would have got off the ground if we hadn't been curious enough to get deep into it and articulate its value to the world. And no one's paid me a billion dollars (well not yet, anyway). 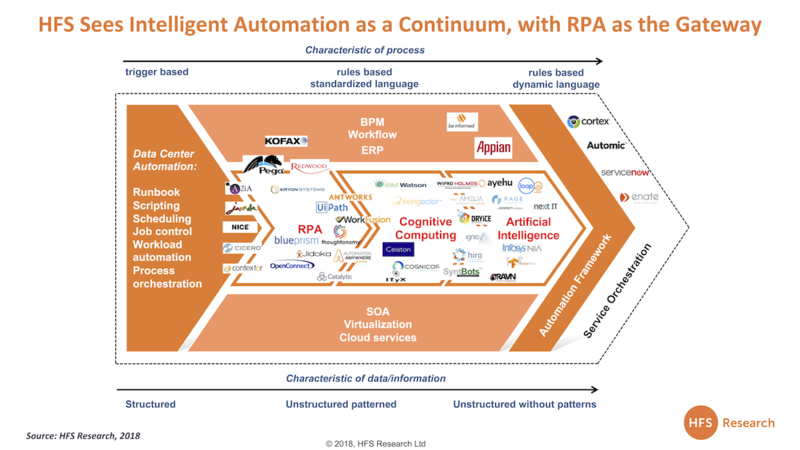 When we released the first "Intelligent Automation Continuum" in 2015, we made it very clear that RPA was clearly the first step in a much broader roadmap to achieve beautifully-automated intelligence across your enterprise. And today, this gateway philosophy has never been closer to reality. RPA, when executed well, delivers a digitally-transformative experience to business operations executives, where they can - for the first time - fundamentally change how a process is designed to process data much, much faster. Suddenly, firms have the chance to make fundamental changes to how they design workflows, instead of persisting with doing things the same old way, but with lower cost people and more efficient delivery models. Isn't that enough for now? Why does the hype take it to a place where it's only going to disappoint? If IBM's leadership already thinks these firms are massively overpriced, are there really others out there which will take the plunge? When I see executives who previously stared at excel sheets all day (while beating up BPO providers for overcharging for insurance clerks in Delhi) actually getting trained to redesign workflows using scripts and GUIs, it warms the soul. We are actually trying to do thing better... not just cheaper! So why can't we be content with making this actually work before we get too carried away? Suddenly, the whole RPA value proposition, which has carefully matured from the "Oh my God, a robot's going to take my job" to "OK, I get it now, RPA actually frees up time and fixes process breakages and staves off costly investments" has been injected with some serious hype-steroids, where suddenly these firms are worth billions of dollars, some are actually declaring they are going to deliver their own consulting services (really) and quickly move up the continuum to offer real cognitive and AI capabilities. I'm sorry, but when were the RPA firms going to compete with Google and Microsoft? Am I missing something here? 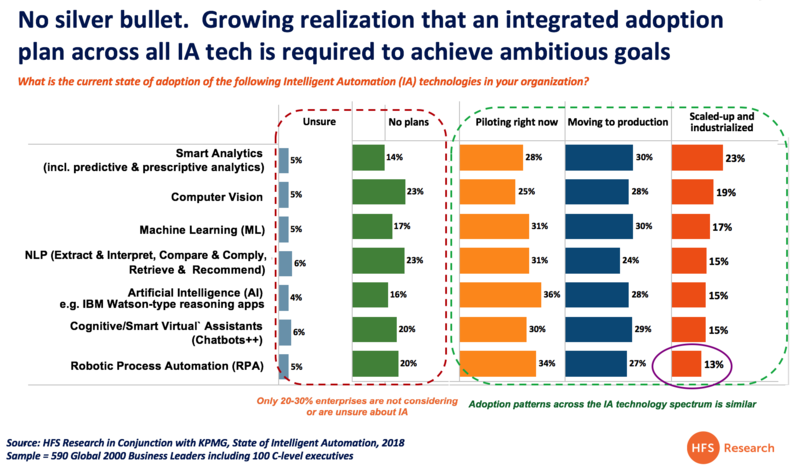 The real data shows just how not-ready we are to declare some kind of robo-victory - executives must evaluate how all intelligent automation technologies can work together to take us to the promised land. RPA provides a terrific first stop for executives to make real underlying changes to their processes. Once processes are digitized, there is so much more we can do with the data being produced, which is where other automation and AI tech comes into play, such as Machine Learning and predictive analytics and sophisticated cognitive computing. Now it's always critical to focus on the "what next", and in the case of RPA the possibilities are limitless, but only when you have mastered how to digitize your underlying mess that has plagued your organization since before the days COBOL was the next big thing. Then it's about how you reel in the analytics and AI possibilities that truly take your business to a new level of data heaven. But let's get past the gateway first... let's not get ahead of reality and mess this one up, folks. One firm that's kept driving consistent growth above the industry average, despite the cries of "commodotization" and "cannibalization" in the business process management arena, is Genpact. This firm blitzed the offshore-centric BPO industry in the mid 2000's, with its focus on the "virtual captive", its obsession with process excellence (emanating from its GE roots) and the willingness of enterprise operations leaders to invest in its energetic culture. As times evolved and other aggressive outsourcers rolled up their sleeves, Genpact has increased investments in higher-end process and operations management expertise to maintain its early tranche of enterprise customers, while focusing on the next wave. Making a concerted focus on building a Design Thinking competency out of its LEAN roots, while adding skills in AI-enabling and digitizing processes, Genpact has not been afraid to stay ahead of industry disruption. In fact, its process roots have often bolstered the firm's credibility when driving industry narrative, as it understands the real changes enterprise need to make at the process and cultural level, if they are genuinely serious about a OneOffice Framework. Phil Fersht, CEO and Chief Analyst, HFS Research: It’s great catching up again, Tiger. We’re looking at a lot of serious tinkering and experimentation with new technologies in the business process management (BPM) space. How has a company like Genpact evolved over the last 18 months, and where do you think things are going in the next couple of years? Tiger Tyagarajan, President and CEO, Genpact: Phil, thank you for the opportunity to spend some time talking with you. I like the word you used—evolution—and the period that you applied it to—18 months. In the world we are in, evolution is the way to think about things. I distinguish that from revolution, which is to drop everything that you’re doing and go after something new. In our business, we think about many of our journeys as evolutions. We’ve always had depth and process; we understand how to bring the science of process to problems and how to generate value. We’ve always looked at process outcomes as important metrics to improve, and we’ve used methodologies like Lean and Six Sigma enough that we’re effective with them. We’ve added new capabilities that didn’t exist six years, four years, and 18 months ago. Six years ago, we had nothing on digital; four years ago, we started building out our capabilities; 18 months ago we started scaling those capabilities and continue to scale them.